Starting a new job is almost always at least a bit stressful, yes? There are so many things to learn: procedures and rules, getting to know all the new people and trying to remember their names (let alone trying to pronounce them correctly), actually performing the job….you know, learning the ropes. I’d taken an online ‘TEFL’ course while I was still in Chico as preparation for coming to Vietnam. Teaching English as a Foreign Language. I’m glad I did because many job postings state it as a requirement….though you can easily get around that if you have a Bachelor’s…and I think I’ve made it fully clear I haven’t got one of those…. But it was also significantly helpful to me in two other very important ways – the first being a review of English grammar. All that stuff you learned in grade school and then promptly forgot …..yeah, that stuff….. Not that I’ve retained all – or much – of it in my head by any means….which brings me to the second, being the value of the internet. There is a plethora of websites for tefl teachers (if ‘plethora’ isn’t one of the funnest words in the English language, I just don’t know what is…). So, there’s plenty of help out there for a new tefl teacher: games and activities for the classroom, worksheets you can print out, explanations as to what a third conditional and a gerund are…. that kind of stuff. 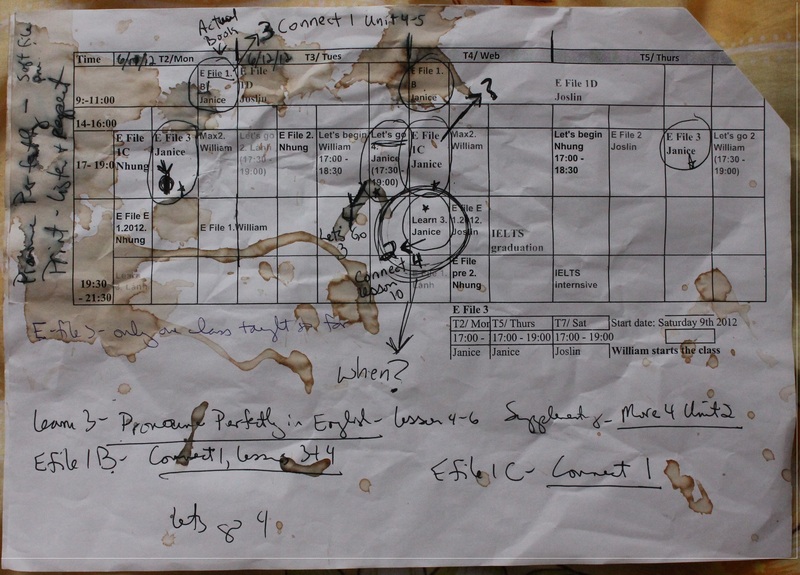 What my tefl course did not prepare me for, however, was scheduling. Rather, understanding the school schedule. Rather, understanding the mind of someone who puts together a schedule that looks like this…..
…..okay, granted, it didn’t look quite like this when I first got it. I had to make it look like this so it would make sense….. The problem was that they put the schedule together using books that we will potentially use….in the future……not the books we are actually using in the present….. see? It already doesn’t make sense, right? All the classes on this schedule are named in accord with the book that will be used in the class….but those aren’t the books we are using in class…they are the books we will be using once the first five classes have been taught. So, say, when I’m actually teaching “E File 1 B Class”, the book I teach out of is “Connect 1″….and somehow I’m supposed to know this….. and the first five classes could take as much as five weeks to complete….or three weeks….or two….since each class may only be on one or two days of the week. So, I’ve got to keep track of how many classes have been taught…..some of which are taught by other teachers who don’t necessarily make note of it in the record books….which are another new thing to learn to read…..anybody else ready for a beer….? Let’s Go 4 is taught from Let’s Go 3 …..who’da thunk…? E File 1 C is taught from Connect 1 & Pronounce Perfectly….isn’t that the same as E File 1 B? …..never mind…. ….easy peasy, right? Everybody got that? Oh….and one more thing I’ve got figured out – from here on out I’ll avoid setting my coffee cup on the windowsill on top of the mosquito netting/curtain when it’s windy….. boy, that cup’ll just go flyin’! Wow! I’m going to have to read that blog post again to make sure I understood all that, so don’t even ask me to try to teach it! You’re doing great! Believe me, I hear ya! Previous Previous post: A day at the beach….